Android OS Vs. iPhone OS: Which One is the Best? If you are choosing between the Android operating system and the iPhone OS (iOS), then you should first decide which features and functions are most important to you. The information below should help you decide, although if you do not know what is important to you then you might have a problem. The first thing you should be aware of is that Apple keeps a strong hold on its operating system, while Android started life as part of an open alliance of 84 electronics firms, backed by Google, with the objective of developing a consistent operating system between them. Android is adaptable, and even though Google purchased it, other developers can use it. For example, Samsung uses it the firm’s Galaxy smartphone, and LG also uses the Android OS. iPhone is specific to Apple, which puts the iOS in direct competition with all other smartphone manufacturers. This is one reason for Android to be outstripping Apple devices in sales. One of the problems with the iPhone OS is its limited compatibility with non-Apple portable devices. If you prefer a simple interface, then the iPhone OS offers a simple and clean menu system that those new to smartphones will appreciate. It is significantly easier to navigate than an Android OS device. However, if you like digging deeply into menus to find the app or feature you are seeking, then the Android OS will make you drool! Often simplicity is not best, however, and too simple a menu system can leave many options behind – such as a QWERTY keypad. The Android interface is ideal for QWERTY typing, rather than the type of keypad that drives many people mad when they try to be quick with their messages, making errors when hitting a glass or plastic screen. Android facilitates the use of a genuine keypad with real keys where your finger doesn’t slip on the plastic. You can purchase a number of smartphones offering real physical keypads that slide from under the touchscreen, and of a type that the iPhone OS cannot support. Android wins with multitasking. Apple’s OS4 has improved multitasking from previous versions, but Apple restricts the iPhone to its Apps store, and the capability of the iPhone to multitask is dependent on the Apps store classification. This can significantly compromise multitasking speed and efficiency, and Android wins every time here. It’s the old Apple fixation with its own stores that restricts the OS from being used to its full capability. Android, on the other hand, has no such restrictions, and while this is not ideal, it is still preferable to the restrictions imposed by Apple. The Samsung Galaxy 10.1, for example, uses the Android 4.0 (Ice Cream Sandwich) OS which offers true seamless multitasking between multiple screens. The use of folders is new in the iPod Touch, but Android has offered them from the start, thus giving them a head start in this method of organizing your files on portable devices. Many people do not need folders on their smartphone, but if this is an essential feature for you, then Android wins hands down. Without a doubt, the Android OS beats the iPhone iOS hands down! This is not because of any technical difference between the operating systems, but simply because Android is open source. Even though it is owned by Google, the software is open for developers to use to generate apps. You will find an app for just about anything that is compatible with the Android OS, while iPhone OS apps must be approved by Apple. Yes, there are many iPhone apps available on the market – from the Apple Store at Apple prices, though to be fair some are free. With the Android OS, however, you can go online and download unlimited apps suitable for the operating system. If you want an app to carry out a specific task, you have a significantly higher chance of finding it for Android than for any Apple device! Which is Best: The Android OS or the iPhone OS? Which is best between the two depends on your own personal preference. Apple fans will prefer the iPhone OS because it integrates perfectly with other Apple products such as the Apple Mac computers and laptops, the iPod and the iPad. Not only that but the unified email inbox is neat and offers something that Android cell phones do not have – unless you find an app out there that offers this feature. That’s something you cannot get with the iPhone operating system because it is patented and not open source as Android is. Anything else that is email related, however, is also available on Android devices. Each offers great game options, although the open source nature of the Android OS will likely push it into the lead in this respect. With regard to games, Android lags well behind iPhone- in fact, it is next to impossible to find good games for the Android OS. Flash is another problem, though in this case with the iPhone OS. Apple has always been critical of Flash, and if you use Flash or want to access sites or apps that use it, then Apple will not allow you – Android will! In conclusion, there is very little between the two, although the open source nature of Android offers the opportunity for a more diverse range of apps, if not more in actual number. With the iPhone OS, you are restricted to apps and other software that Apple approves, while Android is open to anyone that wants to use the operating system to design an application. 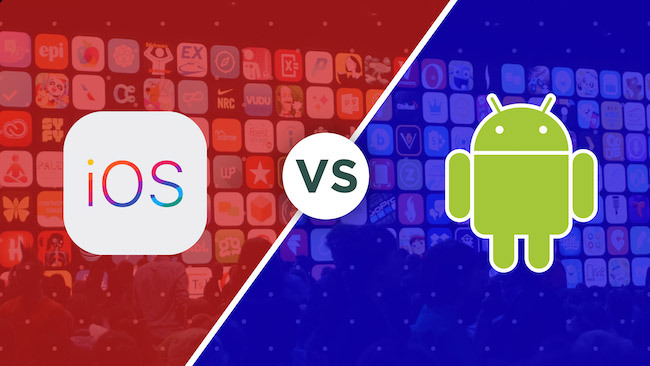 Android OS Vs iPhone OS: fundamentally, the choice is yours and the differences are not sufficient to place one much higher than the other. Apple fans will use nothing else, even if restricted to the current version of the iPhone, while Android users will like the availability of different cell phone models. I can’t DISAGREE more on the Stability Point!! Anyways good comparison, I am happy with my iPhone. I’d still go for iOS. Haha! Android is definitely better then iPhone OS. At least when it comes to creating apps or customizing the firmware. phone is such a thing that you get bored seeing the same interface and thems. With Custom ROM you can customize the look and feel as well add new features to your phone. I am using Android 4.0ICS on my HTC Desire X.. Android seems to be a coool OS for me.. But I never used iOS so far.. I read the whole article and many of Android features are cool and even its lacking many things from iOS .. And I liked your way of expressing via info graphics the most!! We know that these two OS are the leading OS in the market today. But I still choose Android because it has many features and you can customize it and install new ROMs but before that you must root your phone first. There’s a new rooting software today. Hi there. Now iOS6 has come with highly improved apps and features. Then why should anything else!!! I love android because android devices are not costly , no bluetooth problems , support to flash and open source ! Android is future of mobile industry ! Dam sure. Android is better than iPhone. There are tons of features available in android. I have mentioned few points that have noticed android have and iPhone doesn’t. Android Keeps Information Visible on Your Home Screen. Both are good… when it comes to security point of view IOS is good but Android leads coz of free apps available. One can get anything or everything for free in Android Market which is cool. From my point of view iOS is better for simple users, who wants its OS to always run smoothly and flawlessly, but even though Android can be laggy from time to time it is definitely better for advanced users because of its open source nature and customization possibilities. Great article, what I love about android is efforts it has taken let users and manufacturers do what they want to. The flexibility to do things with android is what is making it popular. Whereas with iOS, Apple brand and simplicity to do things which are needful at the best way helps lot of not geeky users. I believe both of the OS are in their own respective worlds, whereas maybe apple fanboys wont like to shift to Android phones like Galaxy S4 or HTC One but it all comes to user’s own choice. Me being apple fanboy swapped my iPhone 5 for Galaxy S4 just because of widgets, the OS which is so advanced right now what iOS gives. Android gives most of flexibility which I liked the most. I think nerds like us like Android more than iOS. Try reading this article, it in reality shows what iOS 7 will provide you which Android 4.2 version has already got last year. Choice is completely ours. I always prefer Android OS. Although I am not much familiar with iPhone OS, but used it for 2 or 3 months. However, after all I am very pleased with Android features and apps. Android is the king. Although iOS is popular because it’s fluid interface but if we buy a good device with high hardware specification then Android is good too. Please no compare apple with android, Apple always give their quality to their customer. I started my story with symbian powered gadgets by Nokia and ended up with Android devices. I’ve also windows phone from Nokia. The good thing I like about Android us the avaibility of free apps for different purposes. whereas when we take top class apps on iTunes they are always premium bundled with pricetags. If I don’t find any app of my need I look for other android developers. Some of the premium apps are also available off the android play store. I’ve been using android since the I left symbian and I love its flexibility of customization. Great side to side comparison. But, literally, I like iPhone’s design and look. Android and iOS they both stand strong at their respective place. Andriod user finds iPhone insane and vice versa. I have used both these products but find iPhone much easy and effective. nice article,informative one,you clear the confusion and misconception about android os and iphone os.i use android but i prefer iphone os earlier and but by this precious review i like android because there is no boundary and limitation.Thanks for sharing.Great job. Nice article Rajesh namase. I think you are Indian. I had been reading your each article from past 6 months. You write very well. I am having both Iphone and smartphone. But then also i will go for Smartphone main thing about them is that we got a diversity thier. and can choose according to our budget. They are both smartphones idiot! And you call them both “phones” only, you guys don’t always have to use the word *smart before the word “phone”, because 80% of the people have phones with touch interfaces today! To each his own. iPhone and iOS work best for my preferences so in my opinion, it is better. I have friends who use android phones though so I know it’s also good. There’s really nothing to get mad about whether you’re using one or the other, it’s all about what works best for you. Anyway, great comparison Rajesh! As i have used both the mobiles i am more comfortable with android as we can customise our own Android phone as we like by doing a little bit of hardwork. As the opensource Android helps several enthusiasts to develop the platform.As the people can create their own Roms. I will go with Android. The iOS 7 i expect to be game changer. We have already heard the rumour that Apple is releasing iphone 5s and iphone 5c soon..so lets wait to find what’s coming! I used iPhone 4 first time in my life and I will not use other phone than iOS iPhone in my entire llife. Android is the future os of next upcoming market so its very wide field where we can easily see our future but these are also facts that android boom is sudden in market and many companies like apple is the constant player in the market so its very difficult to say that how much time it will remain but in the current position its the main leader of mobile os market. It’s two different mindsets, basically. Android is for people who like to customize things and tweak settings. iOS is for people who want to keep it simple. I prefer the latter, but Android is a good OS. I used to have Windows Phone when it first came out and at the time, it was so ahead of everything else. Too bad they never improved it. While features are important, at the end of the day, the smart phone is a style statement and what you choose very much depends on snob value of what you perceive to be better, the iPhone or the Android. Also this is the era of apps. So what your peers use and how to stay connected with them is very much important while selecting a smart phone. i am android lover because of their open source many applications are getting free where in iphone most of apps are paid. Great comparison. I am a android n IOS Developer from surat, love android OS and IOS7 (latest OS). Developing IOS & Android Apps. Well though iOS’s simplicity and great usability attracts more and more users, people will never stop loving android as they provide more customization and more user friendly interface. Nice Comparison between two best OS in the smartphone market. But don’t forget that Google the owner of Android is still developing and incorporating new things into a smartphone for free of cost than the Apple. Just by comparing the differences between Eclairs and Gingerbread we can feel it, Apple is a bit slow in development when compared to Google. The features in Android imo far outstrip iOS… For me, a power user, I’m Android All the way! Really superb comparison about android OS and iPhone OS, Recently I moved my self to android smartphone from iPhone..
Actually my opinion is comparing android os nad iOs android have lot of free apps, and and also low cost apps. One of my favorite App is available for android just 3 dollars, but at iPhone it’s cost is 15 dollars .. Thank you very much for this nice comparison..
the new version of iOS, Apple come with many new features like Healthbook, Better Map App, multitasking, and it easy to use. Android has good number of Apps and we can free to customize. wait for iOS 8.
iOS offers freequent updates while it takes too much time to get update to Android, but also the fact is Android is an open source OS, so it is highly customizable compared to iOS. The never ending discussion..android or apple..
Had them both and its really a difficult pick…apple is extremely stable and offers a whole lot of great apps, for example they have more useful applications for aviation than android has. But than again android really is dynamic! Nice post. I will go for the Android OS instead of the iOS … Thanks. This article is superb and the discussion can’t end but as we see this article the security and interface is good at iPhone whereas Android is open source and in that too many apps are available and we only want apps. Do we? Great points on both Android and iPhone! Although, as a user, I much more prefer using Android over iPhone. However, I use Android because it is open source and it’s a not ending discussion between Apple and Android that which is better? The choice is always belongs to the user and everyone happy with their choice. Apple iPhone is all about feel of richness, however Android is made for exploring and trying out different apps. If you like exploring “say me” go for Android. Android is powerful, iOS is stable. Android is customizable, iOS is elegant. Android is big, iOS is optimized. Android has endless possibilities, iOS has endless creativity. Android is smart, iOS is G.O.A.T. One can’t simply say which one is better. Very nice Article Rajesh ! My vote is always for Android because it works best for personal use! I feel iOS is for who don’t have brain and just wasting his money for logo of Apple only whereas Android is for who are really smart try to do new things like upgrade firmware, hacking passwords and many more customizations. Also, I noticed that iOS user has an ego I can’t understand why you have an ego? You’re one of the dumbass people in the world who use iOS and waste your money for small screen irritating device. There is no comparison between Apple and Android OS, Apple always give their quality to their customer. These days both platforms are very popular for mobile computing, but as compared to iOS Android is very cheap and feature oriented and lots of optional products are available into Android. Here you can choose any suitable product for which you feel comfortable for you. These days I am using Samsung smartphone. Good work. Well iOS is the best coz i haven’t faced any issue since last 2 years. Nice comparison Rajesh between Android and iOS. We know that Android and iOS, both are having their own benefits according to user preference. In India, most of smartphone users prefer Android handsets because it is available in a low price segment with more features. Thanks to share more information on both operating systems. The one thing that differentiates and iOS and Android OS is the smoothness of touch and hanging problems. iOS never hangs and touch quality is way much better than Android. Also the iOS looks professional while Android looks childish to me, sorry no offense. I really like the Android because it’s easier and more updated operating system. More simple and easy to operate. It’s not the first time someone’s made this comparison. I remember back then, iOS was giving a tough time in terms of market share. Today, it seems the world has finally given into the customization features of Android, albeit Apple still has a big chunk of that pie. Quite a good comparison. Android is good when it comes to customization whereas iOS has good security and doesn’t lag . Thats why iOS is loved by many. I don’t know why, but I feel that Android is more restricted than iOS, and it’s only “Pure Google” (the unmodified Android on Nexus Devices) that is restricted. It doesn’t have features like “allow access when locked” or Multitasking Gestures, the wallpaper you set is both on the lock screen and home screen, etc. and THAT’S why everyone hates Nexus (“Pure Google”) devices because their system is sluggish, ugly, and the most restricted operating system I have ever seen on the planet. Note: This is my real name! I personally prefer Android because of the UI, it’s multitasking features, Play Store and most importantly the price. But thanks for sharing the difference, it helped me enrich my knowledge. Keep up the good work. Really great post, I got some correction after reading the post and watching the video sir. Android vs iPhone always competition to be the best. I prefer to use Android instead of annoying iOS feature. Do you know, what to do if you need to transfer a music track to an iPhone? Connect your iPhone a computer (preferably Mac), the computer must be connected to the internet, your internet connection should be DSL, iTunes must be installed, iTunes must be updated. OK, finally the file will transfer. But android, just connects to a simple Pentium 2 PC, copy all your files using Windows file explorer. Well, I was reading out this complete article but I love Android just because of Google Play Store. In an Android, there is a lot of collection of applications for Android. I don’t know anything about the two OS because I use a stupid Windows phone ?. Its really limited. iPhone is bad OS according to me only graphic feature and icons are best everything purchase. Android is best. 100 Point. Great article Rajesh, such kind of comparison makes very clear image about the product. Keep sharing. Great post. I was checking continuously this blog and I’m impressed! Very helpful information specially the last part :) I care for such info a lot. I was looking for this certain info for a long time. Thank you and best of luck. Android is at top, not by a big margin but it beats every other OS’. I prefer Apple tablets over android tablets for business purposes. But I carry an android phone because I prefer Android. This was a great article! Both Mobile operating systems are wonderful for the users. I used both of these operating systems, and i like the Android most. As the Android is Open Source, there is room for improvement in the performance of the OS. Android is best, as we can play lots of games and use latest apps but iPhone is not so great. I was not an iOS lover. Due to its overpricing and certain useless constraints. But after I bought iPhone 5C 2 years back, it changed my perspective completely. The menu is quite simple and clean. The camera is outstanding, the battery is quite good and the best part is touch. Amazing touch response. I personally don’t like iPhone because I think iPhone is just for show off, no use, no function, no Bluetooth. But I love MacBook Pro because of its shape size and functions also, no hang problem in mac. I was not an iOS fan. Due to its heavy cost and many restrictions. But after I bought iPhone 6S a year back, it changed my way of thinking towards iOS completely. The menu is very simple and clean. The camera is extraordinary, the battery is awesome and I totally flood for its responsive touch. I love iPhone but in the usage, all the apps are not supported by it. Mainly on iPhone, there’s no memory for songs, some apps are needed to be downloaded. I hate that. Thanks Rajesh for sharing this wonderful post. Very well differentiate between Android OS vs iPhone OS. This information will useful for all Android and iPhone users. In my opinion, Android is the best. iPhone, we can’t customize by our wish. Android is the top and easy customizable smartphone OS ever. For personal use, In US areas iPhone is preferred for everyone, but like in India there are a lot of Android users. And Android has too many features than iPhone. So I preferred to use Android than iPhone. I am also writing a blog related to tech niche. I personally think that iOS is better for personal use. Due to increasing number of exploits in Android phones, it’s recommended to use a smartphone in which your data will be kept safe. But on the order hand, if you are looking for more control over your smartphone, then you should consider Android phone. So overall, I think it varies from person to person. Hey dear, great post. I Personally like Android, their apps, and support, I never had iPhone, but I know I still feel this that android phones are best. But seriously I loved your post, it would be more attractive for a person like me, I love visuals with this, seriously, you need to put some images in this to catch more audience.